I was late in reading my Time Magazine Essay. I like to read from the back of a magazine forward. I find most real and powerful news is at the end of something, not at the beginning. It is as though the authors of news hide the quality of information at the end of the road—preserved for those hearty thought-hikers willing to traverse the endless peaks and valleys of generally not-so-noteworthy information. In the Nov. 19th issue, which has a cover of a pumpkin pie adorned by an American Flag, Lance Morrow presents an essay titled “Has Your Paradigm Shifted?” It’s about the shift in attitudes between Americans and prior belief systems. Morrow talks about the shifts in attitudes post-September 11, where the old ideas and prejudices toward police and firemen and government have crumbled in the wake of Nine Eleven’s elevation of police and firemen from “pigs” and “gophers” to “heroes” and “knights in shining armor.” Prior to Nine Eleven, he illustrates, it wasn’t camp to wave a flag or claim patriotism as a banner, while today you are “outside the circle” if you don’t tout the red-white-and blue, or feel “righteous” about supporting government’s military might and its power to avenge our sorrow and pain. He comments about how prior to September 11 racial profiling was considered one of the great oppressive threats against the rights of citizens, while today suspecting anyone who looks “swarthy” or Middle Eastern is an act of patriotism by citizens fearful of being attacked again unsuspected. The essay has something for everyone. It hits the nail on the head that separation by many sub-causes divides and conquers, while rallying against the “evil ones,” and “evil doers,” is the responsibility of all—regardless of the veils of differences we cast as insurmountable walls prior to 8:46 a.m., on the Second Tuesday of September, 2001 when the first Terrorist jetliner smashed into the heart of America’s flimsily constructed social, moral, ethnic and religious fences that were ripping and tearing at the heart of our nation’s unity and fiber. But, as with all good stories, Mr. Morrow does not end the tale of the Presitidigitous Paradigm with a rabbit coming out of a hat. His magic elixir which one might think would end with rainbow of glory for all Americans who have been forced to shelve their differences to fight an “enemy from afar” ends with a shroud of darkness. In the last paragraph of what would seem like a Pollyanna piece of patriotic whitewashing of conflicting issues between Americans and their individual search for “righteous indignation” that the Constitution of the United States was not shining as brightly on them as it was others in this country, he pulls a dark, amorphic shadow of something terribly deformed and obviously rancid out of his hat-of-words. The “evil ones” are, and have ever been, the three Horsemen of Terrorism—Fear, Intimidation and Complacency. Oddly, I thought, long before September 11, we have been “victims” of their Terrorism. Blacks versus whites, rich versus poor, privileged versus underprivileged, left versus right—the “electromagnetic flow” as Mr. Morrow said, has always flowed through the veins not only of Americans, but between peoples of the same family, between husbands and wives, rival siblings (Cain and Abel), rival families, neighborhoods, cities, nations. If it weren’t the Irish and Protestants killing one another randomly out of “fear,” “intimidation,” and “complacency,” it was “Jews and Arabs” at each other’s throats, or the “Japanese and Chinese,” or Iraq versus Iran. The “evil ones,” like fashions, come and go with the tides of change. They never disappear, they just reappear in different forms, wearing different masks, dressed in either the most ultra-modern clothing of the 21st Century in the form of “Smart Bombs” or as ancient as a “box cutter” held at a pilot’s throat on an ill-fated flight heading toward the World Trade Center. I only wished he had left out the word “may,” removing the condition from the fact. Evil hides there—in those deep and ancient caves in all our minds. But its most common and nutritious host is that of a child’s mind. Evil—“fear,” “intimidation,” and “complacency” nourishes itself in the mush of an innocent mind that has virtually no protection from its power. It lends its “victims” to a twisted vision of the world, where the fireman and policeman now become “Captain Avenger,” and the President issuing orders to destroy the Constitutional right of “justice for all,” becomes an act of parental vigilance rather than a stone-age totalitarian club to the future rights of the innocent. I felt sad that the Paradigm of Shift that Mr. Morrow presented wasn’t from the Parent of Negligence to the Parent of Vigilance. To me, a child running to embrace a fireman or a policeman was no shift of the paradigm at all, but rather a reinforcement of the old one. The child should be the focus of the paradigm. If attitudes are to shift in America away from “fear of each other,” “intimidation of each other,” and “complacency toward others,” it must be through the change of attitudes between a parent’s responsibility toward his or her children’s belief in “safety.” If the child feels that there is more safety “outside the family” than “in it,” then we have not shifted anything. If a child feels the “government is doing for him what his parents cannot,” we are in dire trouble. If a child feels the police offer more protection than the loving arms of the mother or father, we have lost more ground, not gained more, in our homeland security. If a child is led to believe that Terrorism is the result of attacks from “without,” rather than the thoughts of “fear” (lack of courage to stand up to issues), “intimidation,” (lack of conviction to fight for what is right) and “complacency” (lack of action to change the status quo), then our future has not shifted at all. Instead, the cement has just hardened around our feet. I think it is time the paradigm changes. I think it is time for the Parents of Negligence to become Parents of Vigilance. When that happens, children will embrace the Courage, Conviction and Action of their maternal and paternal Sentinels of Vigilance rather than look up to a fireman, policeman, or the President of the United States as their “Parents of Vigilance.” Not that these models aren’t important. They are. But not at the expense or depreciation of the Parents of Vigilance. 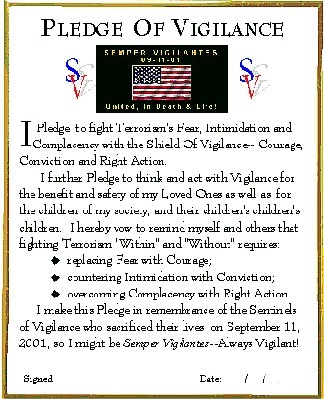 Let them be “Uncles of Vigilance,” not surrogates replacing the responsibility of the family to fight the “evil ones." Terrorism took a break last night. At least, that is, for my grandchildren. Or so I thought. My wife, G-Ma Lori, and I, took Matt and Sarah, our five- and three-year-old grandchildren, uptown to watch the balloons for the75th Macy Day Parade being blown up. It was a great time. Snoopy and the Rug Rats and Ronald McDonald, and big, friendly dragons swathed in bright, warm colors grew from nothing into giant figures as we strolled through the two blocks filled with happy, joyous people and children on 81st Street. The kids rode on our shoulders and excitedly watched and oohed and awed as long hoses gushed lighter-than-air gases into the balloons giving life to the Sentinels of Happiness so they could float down the NYC streets this Thanksgiving Day bringing joy to millions watching it live, and more millions viewing it on television sets around the world. Happiness within a child includes experiencing the vast depths of the imagination where reality and illusion have not yet been cleaved, and they can still wonder about the “realness” of those symbols they have grown up with in story books and cartoons. Amidst the imaginative beauty of the balloons, I realized that a child’s mind was not free of the “monsters of Nine Eleven.” While magic and beauty surrounded us, there was that lingering threat, that quiet, seething inside the child from experiencing the impact of Terrorism in a way that expressed itself in a simple story about monsters flying planes into buildings. I didn’t probe the issue. I just registered it. As I was walking down the streets with Matt on my shoulders, I thought how great it would be if there was a Sentinel of Vigilance leading the parade—a symbol to the children that they were safe and secure—that one of their imaginary heroes was there to protect them from Terrorism’s Fear, Intimidation and Complacency. Later that evening, after dropping off the kids to their mother, we went home to enjoy some Ben & Jerry’s ice cream. On the news was the history of the parade. The newscaster mentioned that originally they released the balloons after the parade was over, but the balloons exploded as they rose up into the atmosphere and frightened the children, so they stopped doing it. In my mind, when I watched the Macy Day Parade, I knew I was going to make up my own balloon. It would be the Sentinels of Vigilance, floating along with the other balloons, reminding everyone to replace Fear with Courage, Intimidation with Conviction, and Complacency with Action. Have a Happy Thanksgiving, filled with Courage, Conviction and Action.